The idea behind this profiling is to have a better idea about the application performance using the Netbeans profiler that depends on the JVM capabilities.. The profiler will not work unless it is a Sun JDK. Mostly WebLogic come with 2 JDK one is Rocket and the other is Sun JDK. This will let Netbeans calibrate the JDK. - Add filter: Inclusive (osa.ora. *) as filtration for the needed package classes. - Select localhost , Weblogic 9 (works fine with Weblogic 10 as well). 7) Start the Weblogic server using startWeblogic.cmd, it will stop waiting for the profiler. 8) In Netbeans click on Attach the profiler. 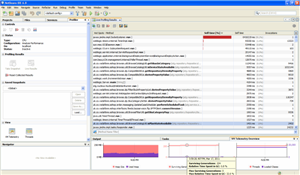 Now enjoy using the Netbeans profiling tools for your application..
You can check the methods duration and number of invocation , the thread count, heap size , Garbage collection statistics ,etc..you need to check..
You can select what you want during configuring the profiler or later on by changing them. This tutorial is done in WinXP and using Netbeans 6.8 and Weblogic 10. Hi, what if my weblogic server is in a linux server ? What is the address for the Server location ? It will work without any issues, you need to use the corresponding scripts at the end of the NetBeans profiler wizard. Usually it is installed under Oracle directory.